Briar pipes are the most common type of pipe, due to the briar wood’s natural resistance to burning, its inherent ability to absorb moisture, and its high quality grain. Through briar pipes originate from the same wood, there are a variety of styles, looks and treatments perfected by the manufacturers we carry. Our suppliers come from around the world, including France, Italy, Germany, Denmark and the USA. Each briar pipe manufacturer has its own unique designs and processes for creating briar smoking pipes. Jobey of France is known for creating briar smoking pipes from roots that have hardened and sweetened for 100 years. They are not the only briar smoking pipe manufacturer to age their briar, however. Mastro Beraldi of Italy carefully selects and ages the finest Italian briar. The mouthpieces on their briar pipes have been specially constructed with an internal pin to help guard against breakage. BjarneViking of Denmark is another briar smoking pipe manufacturer known for their durability as well as quality. Having originally offered affordable freehands, the company’s briar smoking pipes quickly expanded to include a variety of finishes and stains, ranging from the burgundy stain of the Classic Matte to the smooth finish of the Classic Polish. Nording of Denmark offers briar pipes which range from Virgin Unfinished Briar wood in the Signature Series to the very modern and striking deep cut design bowl of the Zebra Pipe series. German based Vauen briar smoking pipes include many exclusive designs, including the C. Barontini-B570, which is an outstanding blend of the apple and ‘sitter’ pipes. Many of the briar smoking pipes from Vauen have silver stem detail and are limited in availability. Radice of Italy offers a special oil cured selection of briar smoking pipes. Their unique production method, which dates back nearly 100 years, gives their oil cured briar pipes a nutty flavor during the ‘break-in’ period. Kevin Arthur - USA uses both plateaux and cross-cut briar from Remeo Briar. This producer’s briar pipes are known for their “easy-draw” stems. Experienced smokers often have special requests for their briar smoking pipes. 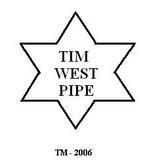 Fortunately, Tim West of the USA gives our customers the opportunity to custom order briar pipes. As you can see from past custom orders shown on our site, Tim West allows customers to choose many of their briar pipes’ features, from quality and finish to the type of stem and material. Of course, if you want a ready-made Tim West briar smoking pipe, we have a large selection on hand, including the Old West briar pipes which were inspired by vintage pipes from the 1930s. Whether you choose a briar smoking pipe from France, Germany, Italy, Denmark, or the USA, the briar pipe is a great choice that offers an affordable, quality smoke that will satisfy even the most discriminating of smokers.